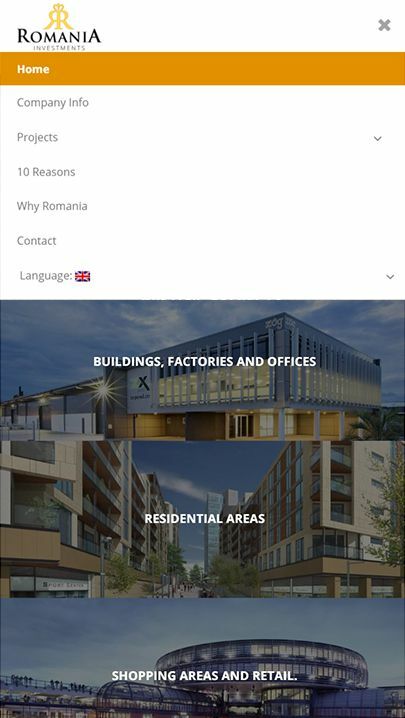 Romania Investments is one of the leading industrial estate agencies for commercial use in Romania. For such a prestige, it needs a brand and a visual identity of the same scale. 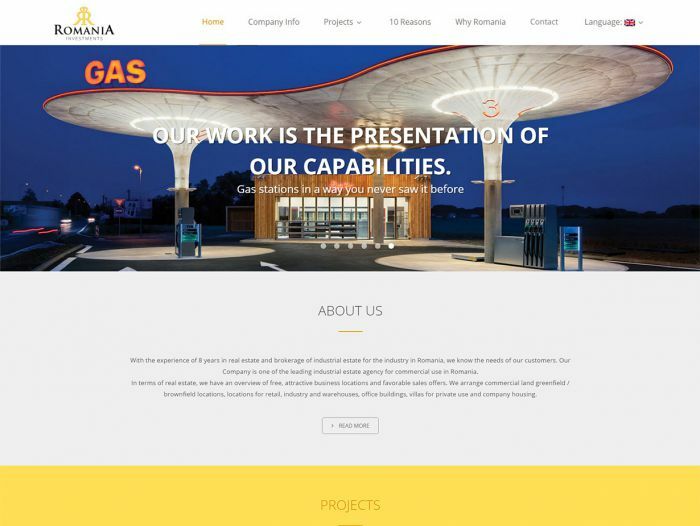 Our agency helped them to create a successful brand image complemented with a resonating presentation website, which we promote to reach out to the far corners of the world. For a multitude of specialised activities, from consulting services to intermediating the trade of hotels, residential areas, office buildings, renewable energy assets, gas stations and IT&C projects we helped them create a strong portfolio, which offers the visitor a fast and direct way to the desired information. 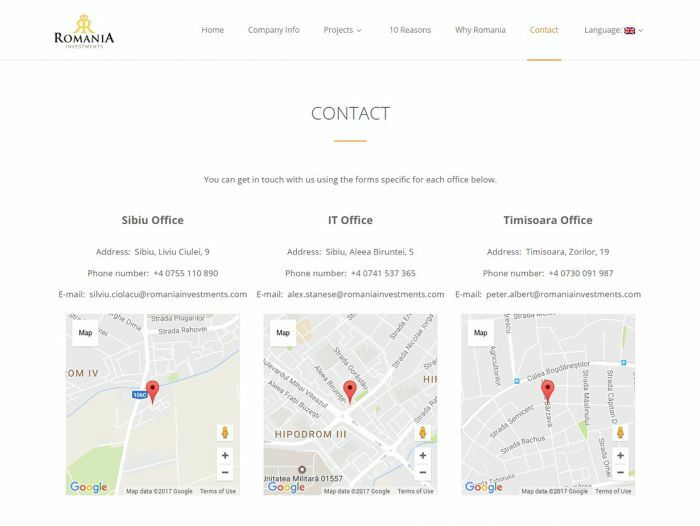 In counterbalance to the dense and specialised information that is presented on the website, we focused a lot in creating a minimalistic design that captures and eases the overview of the visitor. 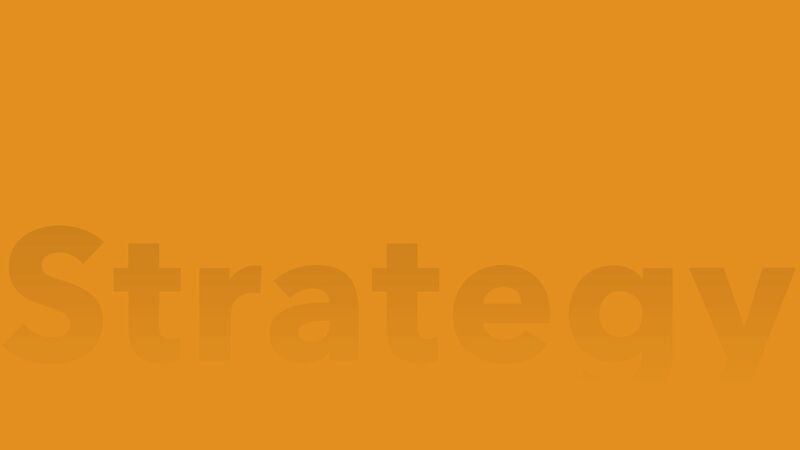 Through our strategic marketing collaboration, Romania Investment’s image now stands powerfully aligned with its leadership position. 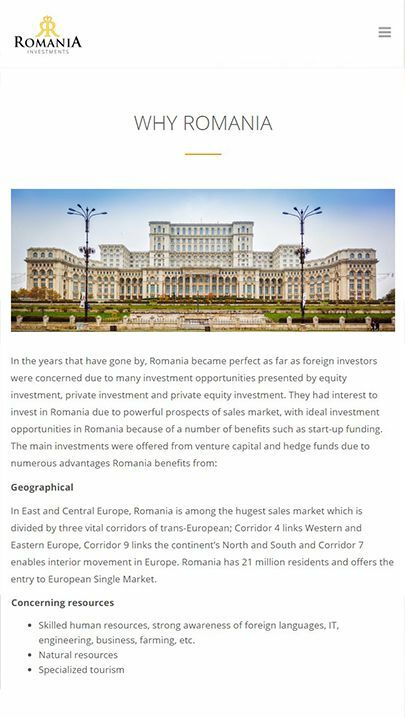 A strong marketing strategy was needed for Romania Investments to deliver the trust, professionalism and seriousness in order to evolve and update their business to the 21st century. nLight Media agency is still working actively for them using some advanced marketing techniques, for both creating awareness and also closing big contracts with investors and investment funds. 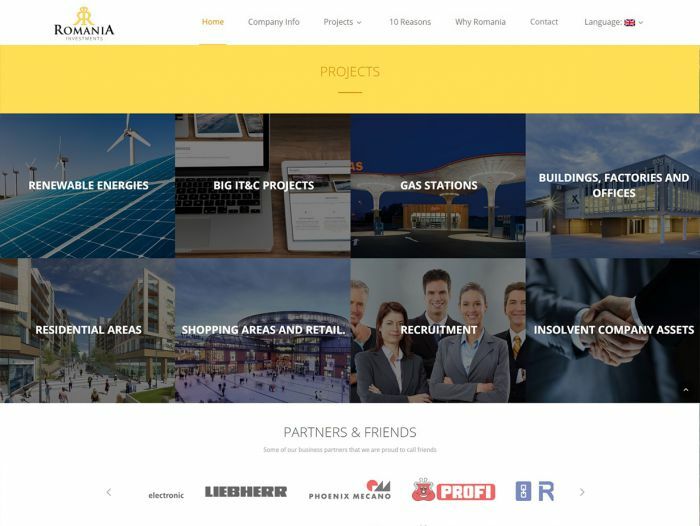 A fine combination of SEO (search engine optimization), SEM (search engine marketing), SMO (social media optimization), SMM (social media marketing) and email campaigns helps Romania Investments to optimally manage their marketing budget for the maximum results. 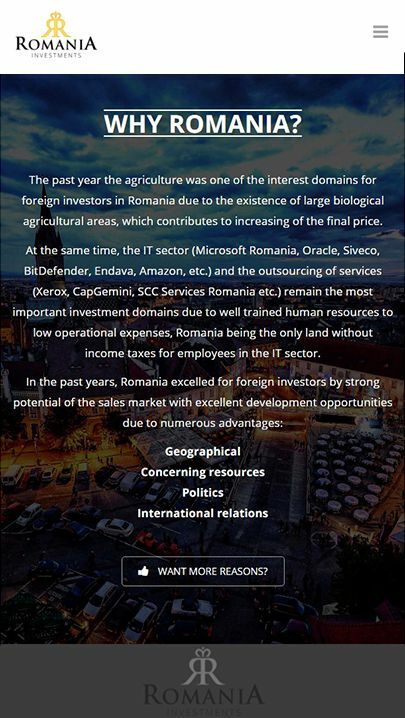 Romania Investments main purpose was to gain visibility concerning their projects and assets, both for sellers and investors. For compelling marketing results, the website was equipped with responsive capabilities who appeal to the nowadays biggest visitors market: the mobile online market. 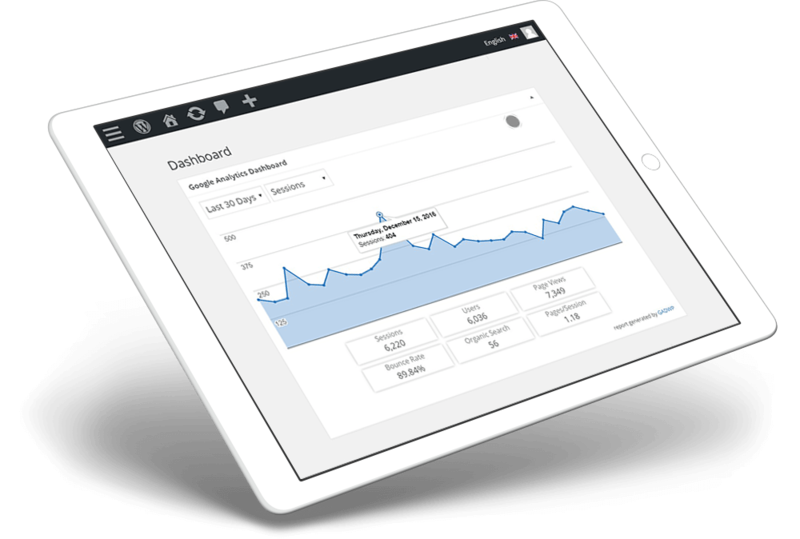 While converting all the information into an easy to follow experience, special attention was paid to the conversion points throughout the users journey. From the technical standpoint the website was also develped with an enhanced security and fast loading capability, for a better search engine indexing and overall user experience.